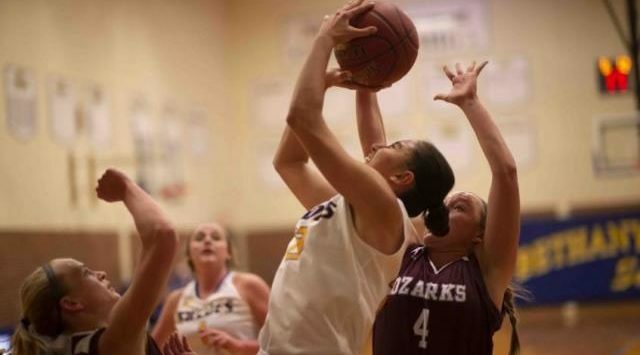 It wasn’t pretty, but the Bethany Swedes women’s basketball team moved to 2-0 in league play with an 85-69 win over Southwestern Tuesday night in Lindsborg. The contest featured 55 combined fouls, and 47 combined turnovers between the two squads. Southwestern attempted a season high 43 free throws, while Bethany shot 27. The Swedes won every quarter, and put up a season high 85 points in their 16 point victory. Bethany led 38-28 at halftime, thanks to Sena Atkas’ team high 12 points. Southwestern came out re-energized in the third quarter and cut Bethany’s lead to six, 50-44 with 2:22 left. Bethany guard Erin Richardson scored the final five points of the third period, knocking down a three-pointer followed by a pair of free throws, and Bethany took a 55-44 cushion into the fourth. The Swedes opened the final frame on a 9-0 run to balloon their lead to 20, 64-44, with 7:56 remaining. Bethany center Cassidy Enns finished with a double double, registering 19 points and 10 rebounds. Guard Kelsi Mueller had a game-high 20 points, and hit 4-8 from downtown. Bethany’s next action is Monday, November 26 at 6pm as they host the Ottawa Braves. Bethany will be seeking a 3-0 start in conference play. There were plenty of bright spots for Bethany in their 83-72 loss to Southwestern Tuesday night. The Swedes took a lead into the locker room 37-35. It was a back-and-forth start to the second half, with Southwestern leading 48-47 with 11:58 to play. Led by all-league guard Cameron Hunt, the Moundbuilders pulled away by outscoring Bethany 19-8 over the next five minutes. Hunt finished the game with 24 points, four below his season average, and shot a season-low 42% from the floor. Bethany went 6-15 from beyond the arc in the first half, but hit only 2-13 from downtown in the second half. Guard Tyler Larkin led Bethany with 23 points, on 11-19 shooting. He also had six rebounds, and five assists. Isiah Saenz had 20 points in the contest, and went 4-10 from beyond the arc. Bethany will attempt to grab their first conference win of the season on Monday, at 8pm vs. Ottawa.